Elk hide, glass beads, artificial sinew, wool blanket, metal studs, steel, found pinewood block, and fur, 56 × 24 × 11 in. Collection of Tracy Richelle High and Roman Johnson, courtesy of Marc Straus Gallery, New York. 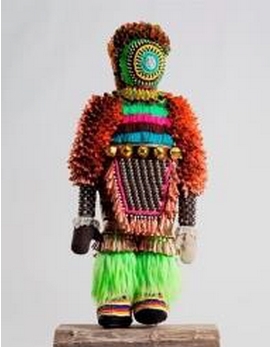 Image courtesy of Jeffrey Gibson Studio and Roberts Projects, Los Angeles, California. The Seattle Art Museum presents Jeffrey Gibson: Like a Hammer, a major survey of works from 2011 to the present that reflects the artist’s deepening exploration of his Indigenous heritage, legacies of abstraction, and popular and alternative cultures. Organized by the Denver Art Museum, the exhibition features over 65 works produced during a pivotal time in the Jeffrey Gibson’s career, including abstract geometric paintings on rawhide and canvas, beaded punching bags, sculptures, wall hangings, and video. Reflecting the complexity of modern identity, Jeffrey Gibson’s work envisions a more inclusive future. A contemporary artist of Cherokee heritage and a citizen of the Mississippi Band of Choctaw Indians, Jeffrey Gibson grew up in the US and urban centers in Europe and South Korea. As a young adult, he was involved in queer club culture and interested in popular music, fashion, and design. These experiences inform his vision of exuberant hybridity, in which glass beads, metal jingles, ribbons, song lyrics, and abstract geometric patterns come together. Gibson’s use of materials and references that resonate in modern and contemporary Western art, as well as Indigenous and ancient cultures, establishes a unique visual vocabulary that gives rise to new possibilities and points of connection. A highlight of the exhibition is 15 punching bags, most of which are from the Everlast series that marked an artistic breakthrough for Jeffrey Gibson. Intricately adorned in beads, fringe, and jingles, and often incorporating text, the punching bags shift gender associations between the masculine and the feminine. They also prompt reflection about the history of violence against Indigenous cultures and signal a call for resilience and perseverance. Like a Hammer also features IF I RULED THE WORLD (2018), which was recently acquired by the Seattle Art Museum for its permanent collection. Repurposed punching bag, glass beads, artificial sinew, and steel; 40 × 14 × 14 in. Collection of the Nasher Museum of Art at Duke University, Durham, North Carolina. Language plays an important role in Jeffrey Gibson's work, with lines from pop songs and other sources adorning vibrant woven and patterned wall hangings and punching bags. Taken from such diverse sources as James Baldwin, Pete Seeger, Culture Club, and Public Enemy, among others, the phrases take on multiple meanings and speak to resistance, reclamation, and celebration. 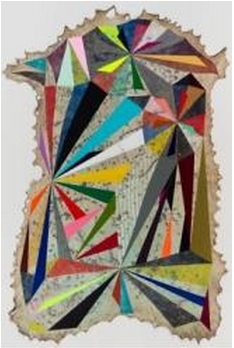 Like a Hammer features many of Jeffrey Gibson’s abstract geometric paintings on canvas and rawhide, in which he explores pattern, light, and color, prompting the viewer to see abstraction through the lens of Indigeneity. Also on view are midsize and large figurative sculptures. The colorful “club kid” figures are inspired by his experiences in the queer club scenes of South Korea, London, and New York in the 1980s and ’90s and connect to his interest in performance, theatricality, and communal experiences. By contrast, his “ancestor” figures are draped with elaborately ornamented cloaks and topped with clay heads reminiscent of skulls or ancient Mississippian culture effigy heads. While visually fierce, these works are seen by the artist as teachers and culture-bearers. Elk hide, acrylic paint, and graphite, 91 x 59 in. One gallery is dedicated to the West Coast debut of DON’T MAKE ME OVER, a multimedia installation consisting of cascades of diaphanous rainbow-colored curtains embedded with lyrics from Burt Bacharach’s 1962 song about love and acceptance, made legendary by Dionne Warwick. The curtains encircle an oversized garment adorned with bells and jingles, and a nearby projection plays a video of Jeffrey Gibson wearing the garment, chanting and drumming as he moves within the enclosed curtained space. A series of irregularly shaped diptych paintings on rawhide complete this installation. At the end of the exhibition is a reading room, where visitors can reflect and read books—including selections for children and young adults—related to the topics explored in Jeffrey Gibson’s work, such as history, politics, culture, and music. Jeffrey Gibson: Like a Hammer is organized by the Denver Art Museum. The exhibition premiered at the Denver Art Museum (May 13, 2018–August 12, 2018) and then traveled to the Mississippi Museum of Art (September 8, 2018 – January 20, 2019). After SAM, its heads to the Madison Museum of Contemporary Art (June 7–September 14, 2019).